Board certified dermatologist, Rita Linkner completed her undergraduate education at Johns Hopkins University, where she graduated with University Honors in Biology. She completed her medical degree at the University of Miami Miller School of Medicine. A native New Yorker, Dr. Linkner returned to Manhattan to complete her internal medicine internship at St. Vincent’s Medical Center, followed by a dermatology fellowship at Icahn School of Medicine at Mount Sinai. During fellowship, she was a clinical investigator in multiple areas of dermatology including psoriasis, eczema, acne, vitiligo, skin cancer, and cosmetics. Based on her research, she has been honored with numerous awards including the Resident of Distinction Award and the Cosmetic Surgery Forum Grant Award. Dr. Linkner completed her residency in Dermatology at the Icahn School of Medicine at Mount Sinai and served as Chief Resident in her last year. A passionate writer, she has published over 70 peer-reviewed papers in various medical and surgical journals and contributed to several book chapters. 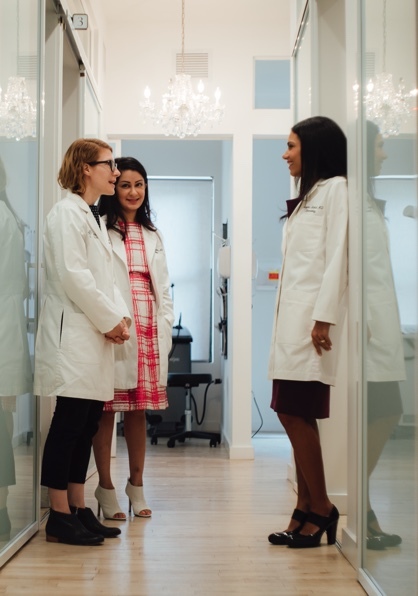 In addition to being in private practice, Dr. Linkner holds the academic attending appointment of Clinical Instructor in the Department of Dermatology at the Icahn School of Medicine at Mount Sinai. Dr. Linkner enjoys practicing all aspects of dermatology including cosmetics, cutaneous surgery, and medical dermatology for all ages.